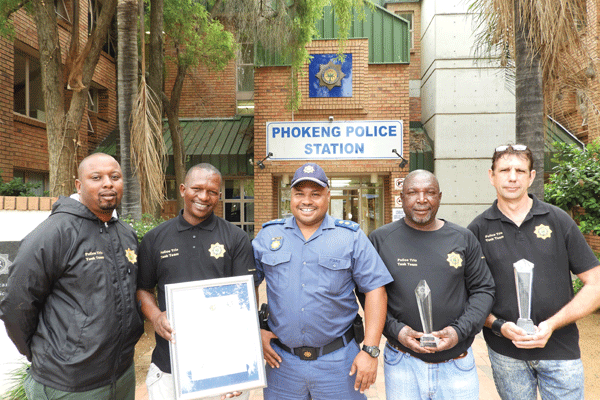 Rustenburg/ Phokeng – A local task team of the Phokeng Police received a very prestigious award at the North West SAPS annual service excellence awards ceremony on 16 November 2018 and again at the National Excellence Awards ceremony on 25 January 2019. The team consisting of sergeant Lazerus Maledu, sergeant Moruam Mokoditlo, captain Patrick Muruwa and warrant officer Jannie van der Walt, received the title of the best detective team in the province and was also awarded the first runners up for the best detective team of the year. One of their greatest achievements that contributed to these awards, came after they had two cases in which they managed to arrest the culprits within 72 hours. This team investigates serious crimes within the Rustenburg area. They are also tasked to deal with sensational murder cases, cash-in-transit heists and other serious investigations assigned to them for further investigation. They actively contribute to effectively combat serious crimes. From left sergeant Lazerus Maledu, sergeant Morgan Mokoditlo, cluster commander major general Arthur Adams, captain Patrick Muruwa and warrant officer Jannie van der Walt.